Grey Low Crotch Trousers Demolition by Red Bridge. Show up and show out in these designer grey low crotch trousers. Featuring low crotch pants in antique grey with black faux leather accents. Constructed with slanted zipper and side button closure. Grey low crotch trousers include belt loops and single front and rear pocket. Designed with incredible asymmetric details from diagonal seams to crisscross knee laces. Includes top laces that wrap around the waist accented by square studs. Give your wardrobe a dark and edgy addition in the grey low crotch trousers. I purchased these pants its big at the waist it stretches but it feels comfortable. I highly recommend. 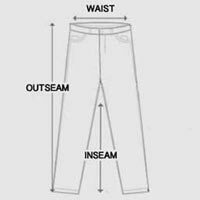 They feel light for jeans. As described, it slightly big.